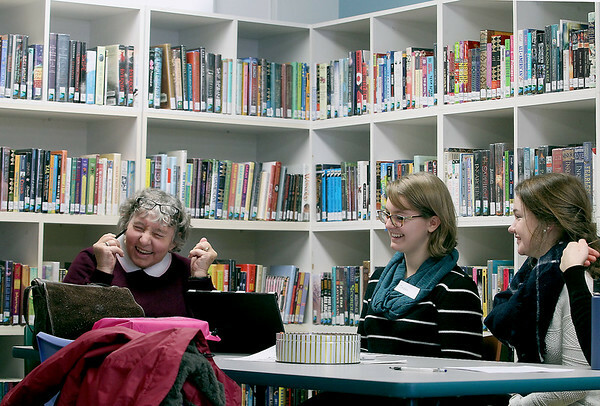 Terry Rondelli, left, gets help from Jordan LaMaide, center, and Mae Smith, both 16, with an online music during the Teen Tech Tutors: Device Advice at the Traverse Area District Library East Bay Branch. Members of Traverse City Central's National Honor Society volunteer to help library patrons with questions about their electronic devices, from laptops to smart phones. "It is great because the kids get their (volunteer) hours, and patrons get their one-on-one time," said library staff member Robin Stanley, who helped organize the event, which she said she hopes will be held monthly.